Previously we told you about a 50 cent per gallon tax credit. That credit expired December 31, 2013. However, HR5771 the Tax Increase Prevention Act of 2014 just signed by President Obama makes retroactive to January 1, 2014 the 50 cent per gallon alternative fuel tax credit and alternative fuel mixture tax credit. This credit is commonly applicable for taxpayers who use propane or liquefied petroleum gas to fuel vehicles not required to be registered for highway use, e.g. forklifts. 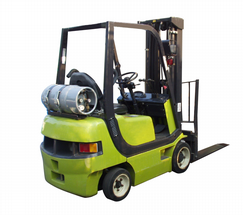 As you probably know, propane used in forklifts is exempt from the Federal Excise Tax. The Internal Revenue Service (IRS) has made it clear that under the terms of P.L. 109-59, the Safe, Accountable, Flexible and Efficient Transportation Equity Act of 2005 (referred to as the Highway Bill) that forklifts fit the definition of an off-highway business motor vehicle and hence, propane used in a forklift is eligible for the 50 cent per gallon tax credit. This is a huge benefit, assuming you took appropriate steps to properly register with the IRS. So read on and if the process sounds a bit cumbersome, it is worth it. As a first step, forklift operators must file a Form 637 with the IRS in order to become registered as an “Alternative Fueler”. IRS will then issue a registration number identifying the forklift operator as an Alternative Fueler. After receiving a registration number, the forklift operator can file a claim for the credit at the end of the year by filing Form 4136. Lin-gas, Inc. is not a tax advisor. We offer this information to you for further review and suggest that you obtain the advice of your tax counsel. Relevant IRS forms may be viewed and downloaded by clicking here. As always, we appreciate your business and hope you will contact us if there is anything we might do to help you complete the process. Please review our website for additional information. We hope this information will offer a tax advantage to your Company and urge you to seek professional tax advice for this most important benefit. If you have any questions, please call Judy at our Evansville office at 800-850-4380.